Natural color 100% organic cotton t–shirt with our balloons, bee hives, mushrooms and anchors displayed in “Rich Compost” and “Spring Apple” colors. 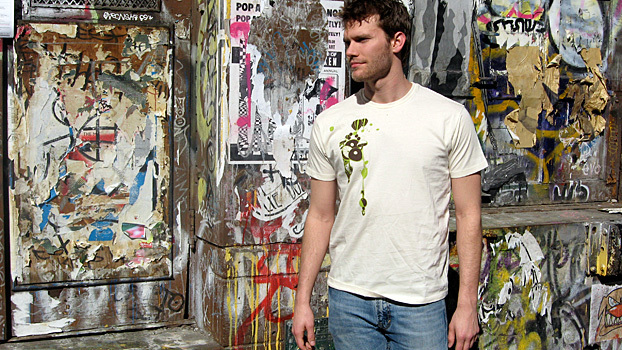 The shirts were hand printed with water–based inks by PJ Portlock of Portland Oregon. We are proud to offer these beautiful shirts representing a collaboration of global artisans. We start with Edun Live Cotton tee shirts both grown and sewn in Africa. To learn more about how Edun is making a difference in Africa, check out this video. Our shirts are all printed and dyed by hand in Seattle or Portland.